It was an August morning on Tybee Island, Georgia. It was morning number 4? Or was it 5? I’m like a little kid when it comes to driving down to Tybee and Savannah. Can we do it again? I keep asking. In Pittsburgh, January and February last like a million years, or that’s how it feels as you go from one icy morning to the next snowy one. Going to Tybee and working the edges of the dunes for butterflies, as early as you can get your bones out there; now, that’s nirvana! We stayed 3/4 of a block from the beach. It was easy to get back to the rental and change into a Beach Boy! Spending a couple of hours on the beach without July crowds. I’m telling you that you’re a lucky soul to be on Tybee island on a bright sparkling August day. This Phoebis Sennae male was working the flowerbed of its first and second homes from the dunes. 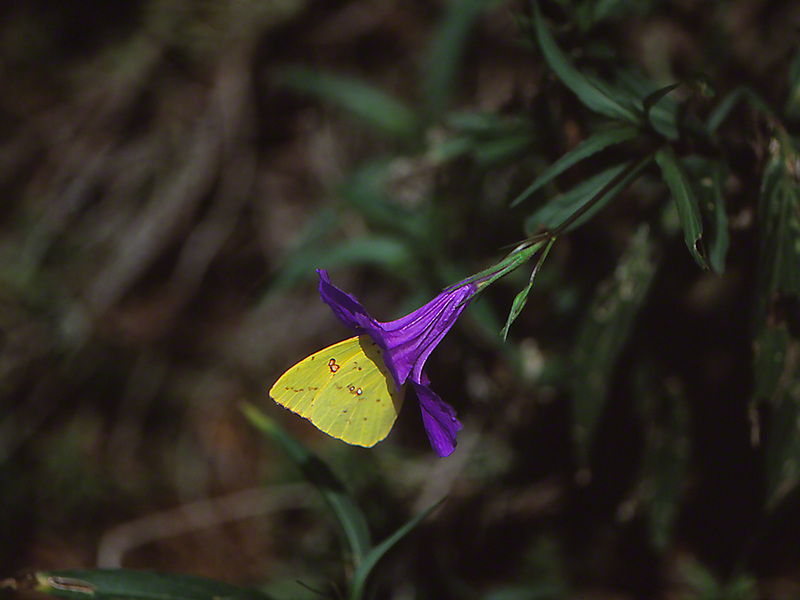 This Sulphur butterfly’s 2.5″ wingspan kept him from me each time I made my approach, but the butterfly suddenly became less vigilant when he got to this bloom. Cloudless sulphurs are generalists who sip nectar from a great variety of flowering plants. That helps because they alight often, increasing your chances of taking a fine photograph. Described as “sun-loving” puts Tybee’s Cloudless sulphur butterflies in the right place: Sunny, inviting Tybee Island. Yes the field guides report them as occasional visitors up here in Pittsburgh, Pennsylvania. I MAY have seen one once, in Raccoon Creek State Park. It flew up so fast I couldn’t make a definitive identification. Walk through downtown Savannah. Tour its art museums, shops & restaurants. Take a break in one of the many, planned downtown parks and daydream about Savannah back in 1850 or 1900. Go and see the porpoises as they cavort in the many river outlets, and marvel at their proximity to HUGE freighters, just several feet in front of the deadly looking bow. Walk the edge of the beach, together, as day drifts to night. Isn’t it wonderful how a photograph of a Giant sulphur triggers such yummy memories? Jeff: Thank you so much for your photos and blog. I grew up north of Pittsburgh and walked through Raccoon State Park many times..but haven’t “come” to butterflies until my retirement 2.5 hours north of International Falls, Minn. in Dryden, On. Just learning about butterflies. Your enthusiasm for them comes through your blog and it makes for terrific reading and viewing. Thank you for taking the time to do this so well.